If you are using a sieve, you do not need to peel apples before cooking them. The sieve will retain the peels while the sauce seeps through. There are many signs that mean fall. To some fall is heralded by colored leaves and frost on the pumpkin. To others it is the return to school. Among those many signs of the season in many homes are rows of newly bottled fruit gleaming from shelves in storage rooms. Most of the canning is probably done by now, but some of the later fruits, such as apples, may yet be available for canning. The nice thing about apples is that they store well for a few months in cold storage. Buy your favorite varieties now and tuck them into the crisper compartment of your refrigerator and you could enjoy a tasty quick snack for weeks to come. If you take it a step further to use a cold room with moderate humidity, you could store a lot of apples for a time. Apples should not be stored with potatoes either as the flavor changes. Apples should not be stored in as humid an area as potatoes as they will begin to mold. The limitation for fresh storage is that the apples must be in excellent condition — stems in place, no bruises or nicks and no insect damage. Of course such apples are useable if you remove the damaged parts. You can slice the remainder and enjoy fresh eating or freeze or bottle them. Home canning of apples is not too difficult and since apples store well for a time, they lend themselves to canning later if needed. Choose varieties suited to bottling, however. Red delicious apples can be used for applesauce and apple slices but in reality, they just aren’t as good as many other varieties. Use a tested recipe when bottling apples. Nearly any apple that is well suited for baking makes a good bottled product. Bottle sliced apples by washing, peeling and slicing the apples. Drop the slices into pineapple or lemon juice or treat them with ascorbic acid (Fruit Fresh or a similar product) to keep it from darkening. Place the slices in jars and cover with water or a light syrup. Process according to recipe directions. Always use a tested recipe when bottling any fruit. The cooking time is a safety issue. The strength of the syrup is a flavor choice but has nothing to do with preserving the fruit to keep it safe to eat. However, fruits bottled in water without sugar will turn dark in the bottles more quickly than those bottled with sugar syrup. Canned applesauce is a tasty winter treat. The instructions in the canning books say to remove stems and cut up and core apples and remove damaged portions before cooking. Some say to remove skins as well. Whether or not you remove skins depends on whether you plan to run the fruit through a fruit sieve or mash it. 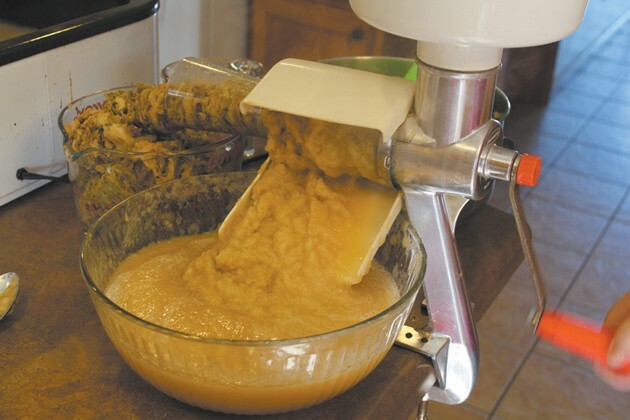 Some people prefer chunky applesauce and may either mash the cooked fruit leaving some chunks or they may sieve some and add cooked chunks to it. 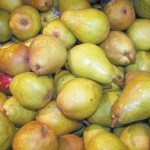 If you run the fruit through a fruit sieve the skins will remain behind and only the flesh and juices will flow through. Red skins may color the fruit somewhat so it won’t be as white as it would if the apples were yellow-skinned or peeled. Mix different varieties of apples for different flavors. If you prefer a tart flavor, use half tart apples and half sweeter apples and reduce the quantity of sugar as desired. 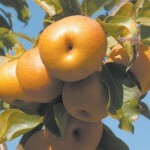 Tart apples include Jonathan and Granny Smith and sweeter apples include Golden Delicious, Rome and Fugi. Pink Lady and Gala make a good sweet/tart combination. Lemon juice is added to many tested recipes after the fruit is cooked and sieved. This is not optional. The lemon juice helps keep the fruit from turning dark and ensures that the mixture is acidic enough to process in a hot-water bath canner. Different varieties and harvest conditions can produce apples of varying acidity. The fruit will cool during the sieving process. Add sugar to taste while it is a lower temperature. Remember that sugar is added to taste — not as a preservative. Taste buds sense flavors more strongly at room temperature than when mixtures are hot or cold. When it is added enough to make a sweet flavor while hot, it may be too sweet at room temperature. Many people add spices like cinnamon to the sauce before bottling it, but it colors the applesauce and the flavor of the cinnamon changes a little in processing. 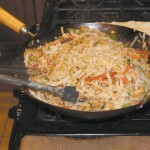 Reheat the sauce to a boil over medium-high heat stirring to keep it from sticking or scorching. Keep the pot boiling over low heat while you ladle the sauce into jars. The instructions say to wipe the tops of the jars, put the lids on immediately and place in a rack over the boiling water in the canner then lower the jars into the canner and bring to a boil to process. This all sounds very good on paper, but the practical reality is that it is difficult to fit enough pans on a normal stove to heat enough sauce to fill seven (or 8 for some canners) quart jars at the same time as you process a batch. Because the canner pot is very wide, most stoves won’t hold a lot of extra pans and many kitchens don’t have a tall pot to conveniently hold 7 or 8 quarts of sauce and bring it to a boil. Scorching can also become a problem in this scenario. My daughter-in-law shared an idea this year that I wish I had thought of years ago when I was processing fruit to feed my family of eight. It is such a simple way to expand the cooking/heating process further than the stove top that probably other people have thought of it. However, I hadn’t. She places the sieved sauce in a large electric roaster pan — the kind often used to roast a Thanksgiving turkey. After cooking the apples and sieving them, she puts the sauce into the roaster and turns the heat high enough to bring the sauce to a boil. After the jars are filled, turn the temperature down enough to keep the remaining sauce simmering. By definition, simmering is a temperature below the boiling point. At that temperature the sauce is less likely to stick and scorch. Leftover sauce can remain at a simmering temperature and possibly thicken a little while the first batch processes and the next batch is being prepared. If the temperature is set right, the sauce will stay at that temperature. It will need stirring occasionally, but not as often. By heating the sauce in a separate place, the heating elements on the range are freed up to cook more apples to start another batch while the first batch is processing. The heating is even and less likely to scorch in these appliances. Even with a large canner kettle on, there should be room to cook more apples on at least one element. The whole process becomes much more efficient in this way and the danger of scorching a batch is reduced. Crock pots could work similarly to a roaster but they heat and cool more slowly. Usually one crock pot won’t hold quite enough sauce for a seven-quart batch so it could require two. The same process could be used for items that need to simmer to thicken such as fruit butters, tomato sauce, enchilada sauce and so forth. Such sauces require quite a while to thicken, but in a roaster pan, it would not need to be stirred as much. Taking the time to save the harvest using tested recipes will save money at the grocery store later. Those gleaming jars lined up on shelves in a storage area will provide tasty eating throughout the winter season and you have the satisfaction of knowing you did it yourself just the way your family likes it.